Sony PS4 Bundles are now available for $249. You can get selected PS4 Bundles from February 12 through February 25. 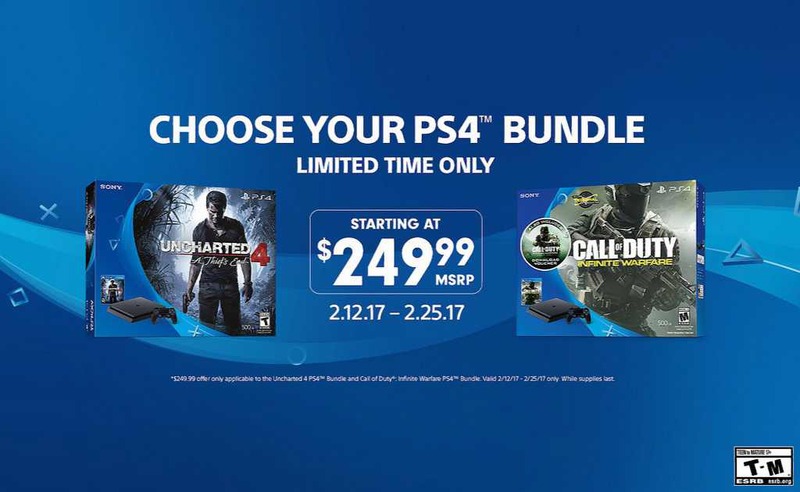 For options, you can pick up the new, slimmer PS4 in either the Uncharted 4 PlayStation 4 bundle or the Call of Duty: Infinite Warfare PS4 bundle for $249.99. The Uncharted 4 PS4 bundle includes the slimmer PS4 model with a 500GB HDD, a DualShock 4 wireless controller, and the critically acclaimed Uncharted 4: A Thief’s End. The Call of Duty: Infinite Warfare PS4 bundle comes with the slimmer 500GB PS4 and a DualShock 4 wireless controller, along with the Call of Duty: Infinite Warfare Blu-ray disc, and a Call of Duty: Modern Warfare Remastered download voucher.